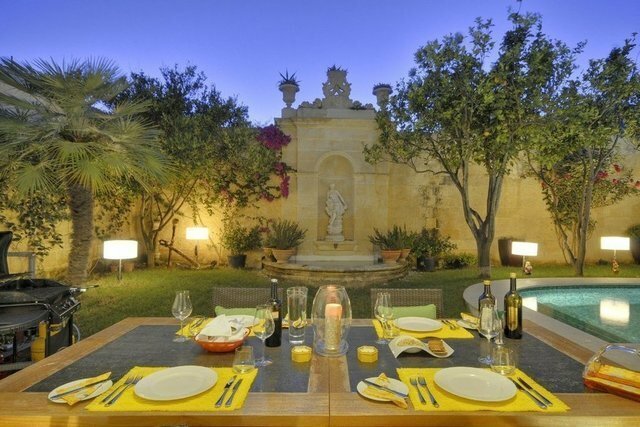 An extraordinary Palazzo exquisitely restored to the highest standards - the epitome of luxury real estate in Malta. The Palace enjoys more than 1,115 square metres (10,700 square feet) of living space with ample entertaining and living areas adapted for a modern family. An impressive marble entrance hall with a glass enclosed courtyard, electrically controlled surrounds the internal part of the palace exposing all rooms to natural light. The entertaining areas are grand and the beautiful kitchen is designed by Italian craftsman Antonio Citterio. Five en-suite bedrooms, a two bedroom annex with its own kitchen and living area serves as guest quarters. The private swimming pool just off the kitchen is surrounded by a large garden, ideal for outdoor dining and entertaining. The property also has an elevator and a 2 car garage. Every square metre of this impressive Palazzo has been impeccably finished with quality and design along with the latest state-of-the-art technology. One of the finest colonial homes in Malta.